Hi there! We're anticipating "the storm of the decade" so we're all settled in here at Pam Kitty Central. Yikes. Crossing my fingers that we maintain power but for sure I'm getting my electronics charged! I finished up my hexagon potholders yesterday afternoon. I feel pretty pleased with them, even the binding turned out, sometimes I find those angles challenging! 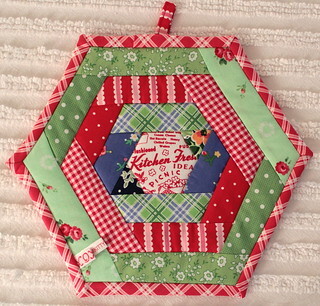 I wouldn't have had such a nice result without the great tutorial from Freshly Pieced. Lee's method keeps your angles in check, something just chopping off the end of the logs doesn't do. These two are getting popped in the mail. Maybe after the storm though. California is getting at on of precipitation, so I'm grateful for that, hope the winds don't wreak havoc. Just love your potholders and the color combination in them! Stay safe - we're getting a 'snow' storm, I can hear the winds getting louder and louder! Beautiful, so neat and perfect! Hope you stay safe from the storm. Hunker down with some hand sewing and binge watch some of your favorite shows/movies. Glad you're getting rain it will make for a beautiful California spring! 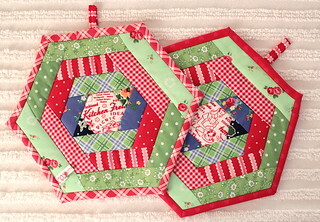 Oh and the potholders are lovely! I made the mistake of quilting mine... I should have left them plain. I love your pot holders and the colors you made them in, also! Then I thought to myself, "you're talking to PKM, of course you love her colors!" Haha! Thank you for sharing the tutorial from me, too.